AOL’s been in a bit of a slump recently – nothing of Yahoo-like proportions, but a slump nonetheless. The company’s earnings call yesterday revealed that while numbers are down, all things considered, it could be worse. The company posted fourth quarter numbers that beat expectations, with a reported revenue of $596 million. This is down 26 percent from what it posted last year, but ahead of the Street consensus of $587.4 million, according to Forbes. The reason for the 26 percent drop is advertising. It’s no secret that AOL has struggled to sell online advertising, and its advertising revenue accordingly fell 29 percent since last year. Subscription rates aren’t doing well either, dropping 23 percent, and access customers also fell 23 percent. “I am very proud of what we accomplished in 2010 as we began the year with a significant restructuring of AOL and ended the year with a significantly improved balance sheet, a number of exciting new products and a new culture focused on winning,” CEO Tim Armstrong said. “We have set aggressive goals for ourselves in 2011 in pursuit of capturing the growing opportunity ahead of us.” Despite any hope Armstrong might have, AOL is in need of a cash generator and a way to drive advertising sales – and there’s a 58 page document out there to prove it. The site appears to be extremely focused on content creation, and some information has surfaced showing AOL is dead set on getting as many eyeballs to its site as possible. 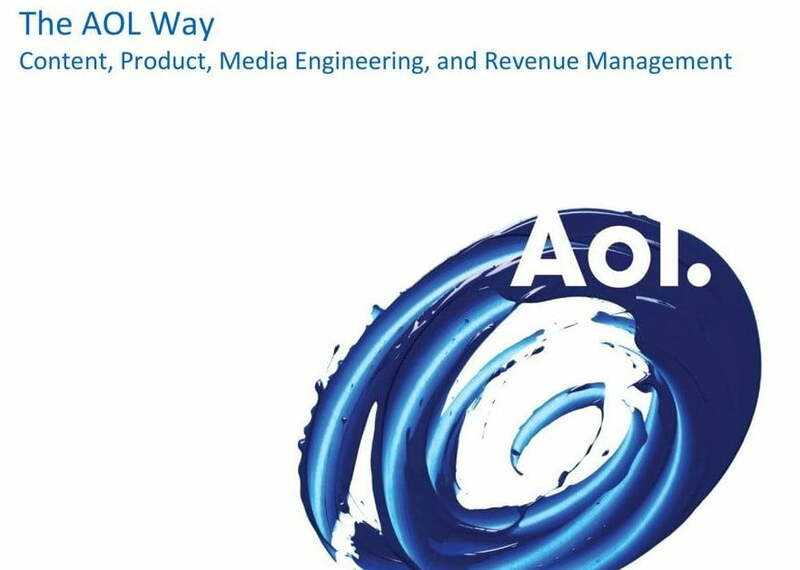 Yesterday, Business Insider got its hands on The AOL Way: Content, Product, Media Engineering, and Revenue Management that makes it clear AOL wants to pump out articles with nothing but SEO and profit in mind. According to the manuscript, Armstrong wants AOL editorial to write an extra 20,000 stories a month, increase pageviews per story from 1,500 to 7,000, and for 95 percent of written content to be driven by SEO. Obviously, this is bound to cause some strain on the writing staff. One AOL journalist told Business Insider, “AOL is the most f—— up, bull—t company on earth. The worst career move I’ve ever made.” One page of the document breaks down step by step how a writer should select daily stories: “Use editorial judgment & insight to determine production. Ex: ‘Macaulay Culkin’ & ‘Mila Kunis’ are trending because they broke up…write story about Macaulay Culkin and Mila Kunis.” Good stuff. So why is AOL turning itself into a content farm? To reverse its sagging advertising dollars. It doesn’t take a genius to figure out that the more pageviews, the more advertising space you can sell, and AOL’s strategy to get there is to dramatically increase content creation and tailor stories to trending topics. Hardly an earth-shattering idea – it’s more the degree AOL’s taking things to that has industry experts shocked. 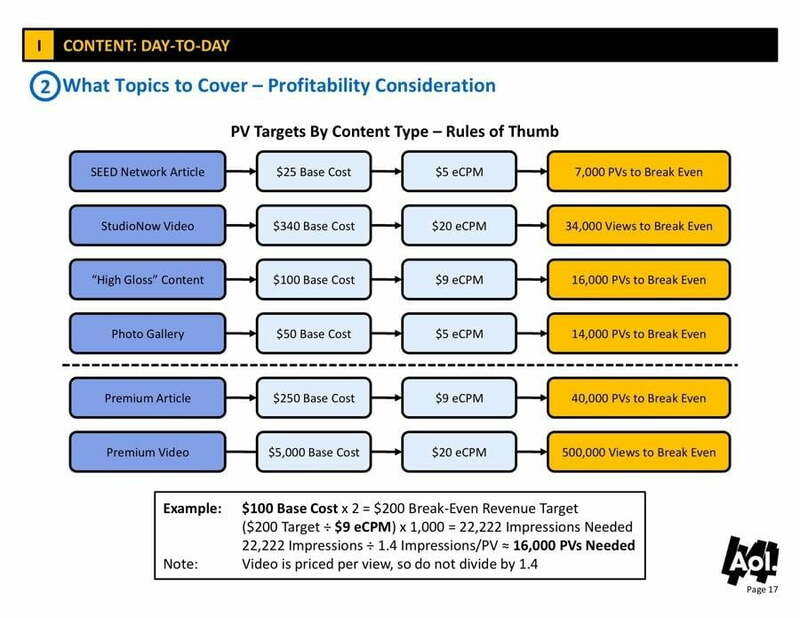 Taking SEO into consideration is all well and good, but there’s a line and instructing writers to consider the “profitability” of their stories is over it. And of course, now that The AOL Way is available to the public, you’d think readers might starting taking the site’s content with a grain (or two…or five) of salt.